Battle of the Sparklings! 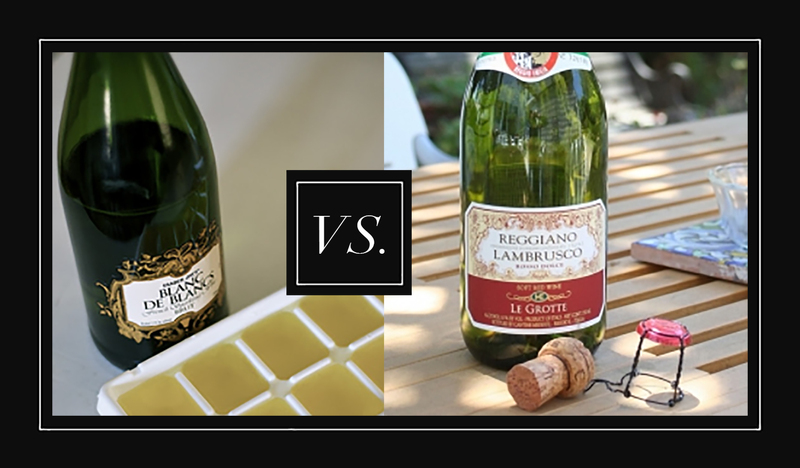 Blanc de Blancs $4.49 vs. Lambrusco $4.99 and the winner is…..
You will adore this Itallian sparkling red. Bouquet is heavy grape with touch or rose – someone mentioned a mash-up of red and purple Skittles. First sip is yummy, bold, surprisingly refreshing. The people around the table were expressing that this is the perfect appertivo with an antipasti or before a steak and of course pasta. This wine is more of a frizzante (less bubbles than what you would expect from a sparkling wine or traditional champagne) it could also be a lovely dessert wine, but do not get the impression that it is cloyingly sweet because it is delightfully light. Guestworthy – buy again! Bouquet acidic floral – one guest said like a stargazer lilly – then the first sip is crisp like a pear and finishes with a sweet mustard, it’s not that harsh but it may not be for you. The description on the label says “…delicate, fruity character and refined, lasting flavor.” That lasting flavor may taste like _________ you fill in the blank (one taster mentioned urine another mustard gas. I am not one to ask how either of them know these flavors, I merely conduct the research.) Overall, in a pinch for a less than special occasion, it’ll do for those who could care less about sparkling, but I would say it’s barely drinkable. LAMBRUSCO beats TJ Blanc de Blanc Brut with out a doubt.